Maui’s big wave specialist Ian Walsh dominated this week’s HIC Pro, presented by Vans, for the second time in his career, exactly ten years after his maiden victory. Saturday’s win at Sunset Beach rockets Walsh to No.1 on World Surf League (WSL) Hawaii’s regional ratings – a ranking that grants him a wildcard into the first event of the Vans Triple Crown of Surfing, which begins November 12. Walsh, 32, excelled through every giant swell pulse this week, then took total command of the 30-minute final, opening with a 9.33 – the best single wave score of the day – backed up by a 7.07 to leave his challengers in need of a combination of high scores early on. 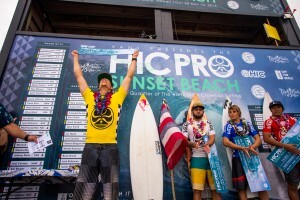 Fellow Maui surfer Billy Kemper, 24, answered back with a 7.17 to land second place, while 21-year-old Kaito Kino from Oʻahu took third place on the podium. 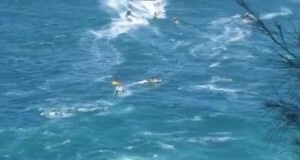 A sizable number of Maui surfers competed in the event on the North Shore of Oʻahu. Wave face heights for the final day of competition on Oct. 31 were in the range of 12- to 15-feet and excellent quality. The big-wave surfer talks about the excitement of winning an event again, and what the path to success looks like for a dedicated athlete. “For this win, it’s hard to explain. It feels so good. You have a goal you’re working for, and to finally be there and stand on the podium and hold a check above your head, it’s hard to put into words. Originally when I won this event 10 years ago, I wanted that feeling back again. You get a little taste and then every event you want to do it again. With surfing there’s so many ups and downs with what the waves do, and the psychology, and how the whole heat plays out,” he says. 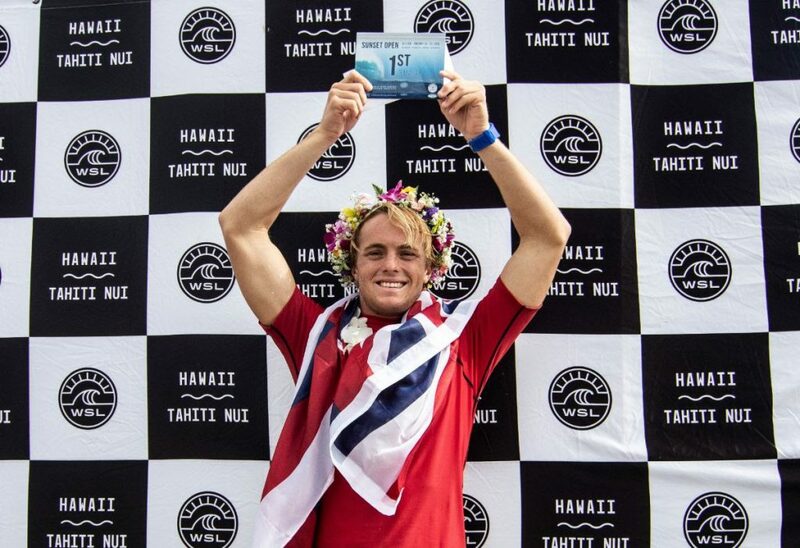 Walsh will compete next in Haleʻiwa at the Hawaiian Pro, and says this HIC Pro win will give him the confidence to surf against the world’s best. “It’s a good start to winter, hopefully I can keep some momentum into the Triple Crown,” adds Walsh. Ian Walsh and fellow surfers on the podium at the 2015 HIC Pro. 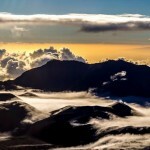 Photo courtesy of World Surf League (WSL). Line-up at Sunset Beach, O’ahu at the HIC Pro. Photo courtesy of World Surf League (WSL). 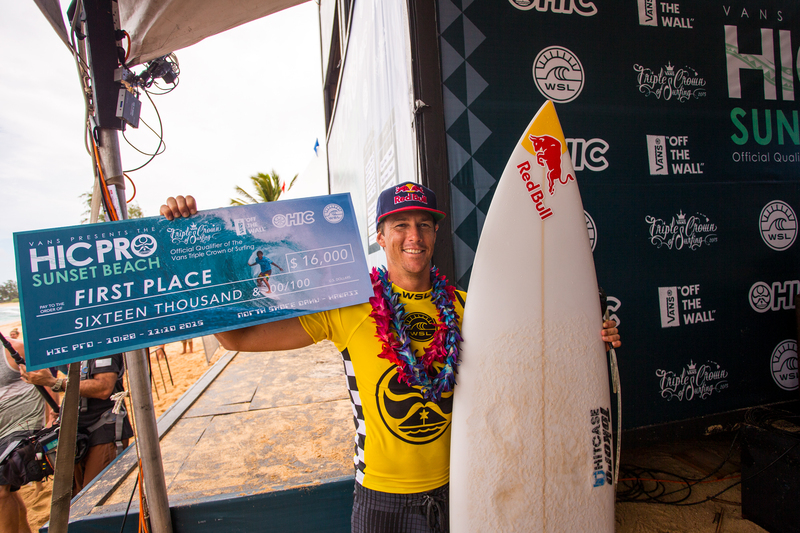 Maui’s Ian Walsh competes in the 2015 HIC Pro, taking first place. Photo courtesy of World Surf League (WSL). Surfer Ian Walsh from Maui competes in the 2015 HIC Pro. Photo courtesy of World Surf League (WSL). Billy Kemper competes in the HIC Pro Final. Photo courtesy of World Surf League (WSL). Billy Kemper of Maui rides in the final round of the HIC Pro at Sunset Beach. Photo courtesy of World Surf League (WSL). Jack Robinson of Australia, who placed fourth at the 2015 HIC Pro. Photo courtesy of World Surf League (WSL). 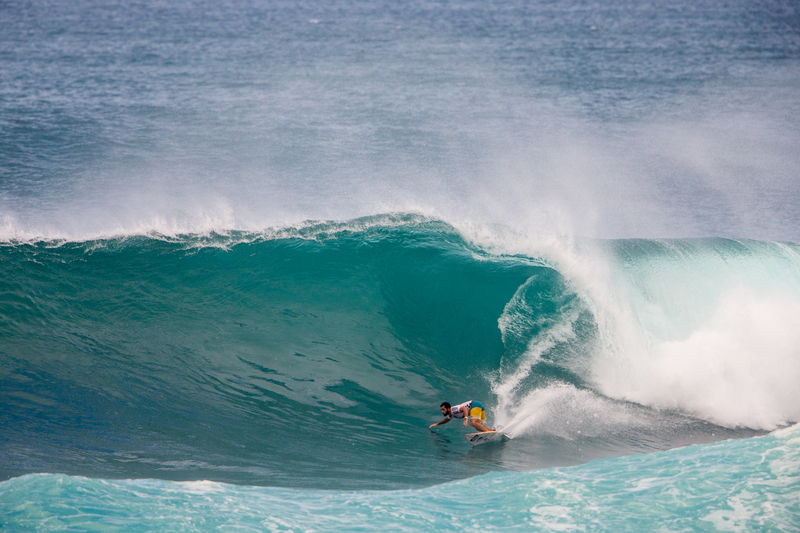 Jack Robinson competes in the final round at the HIC Pro. Photo courtesy of World Surf League (WSL). 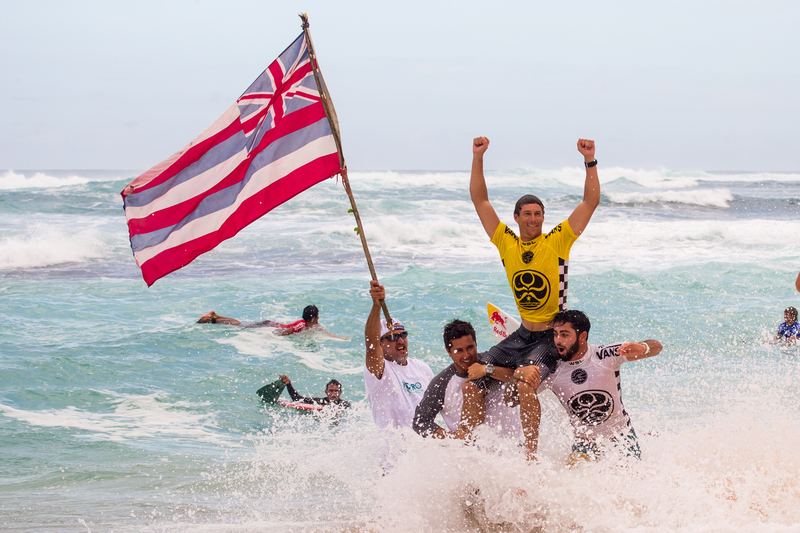 Hawai’i celebrates at the 2015 HIC Pro. Photo courtesy of World Surf League (WSL). Ian Walsh from Maui smiles on the podium, taking first place at the HIC Pro ten years after his first win at the same event. Photo courtesy of World Surf League (WSL). Billy Kemper was in-form throughout the event as well and showcased powerful turns and calculated carves during the Semifinals and Finals. A 7.17 and 6.30 kept him safe in second behind Walsh in the final, yet his determination for first was nearly tangible. Kemper won the HIC Pro in 2010 and drew upon that experience to race his way through from the Round of 96 all the way to a second place podium finish. Kaito Kino found a 7.50 wave score in the first Semifinal against Kemper, Hank Gaskell and Alex Smith (both also from Hawaiʻi), which was his best score of the day. The Honolulu surfer saw one of his career bests today in the WSL Qualifying Series, and powered his way through to a third place finish. The first stage of the Vans Triple Crown of Surfing – the Hawaiian Pro at Haleʻiwa Aliʻi Beach Park – begins November 12, 2015. Australia’s 17-year-old Jack Robinson was by far the teenage standout of the event, and showed uncanny confidence and positioning through the week’s giant surf. His big wave experience comes from growing up surfing Western Australia – a region renowned for its thick, sizable surf. Robinson was unstoppable through every round except the Final, where he spent the first 20 minutes of the 30-minute heat waiting to post an opening score.